91,179 professionals visited the fair from 155 countries and a range of backgrounds of interest to manufacturers: retailers, distributors, buying groups, architects and interior designers. 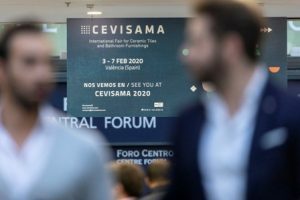 More than 20,000 foreign professionals visited the 37th edition of Cevisama, the international fair for ceramic tiles, bathroom furnishings and natural stone, which took place at Feria Valencia from 28th January to 1st February. As well as the quality of the products on show, the amazing staging created by the exhibitors and a higher volume of business having been done, figures have now been released that confirm that this year’s fair was the best ever, particularly taking into account that machinery was not part of the event this year (it joins the showcase in even-numbered years only). Specifically, 91,179 professionals visited the fair from 155 countries (compared with 90,572 from 154 countries in 2018). Of these, 20,181 were foreign visitors (as against 17,651 last year), a figure that had never been reached before and that confirms the positioning of an event that is increasingly international every year. The figures have led Cevisama to claim that foreign professionals accounted for 22% of the total number of visitors and that the fair attracted visitors from the industry’s key markets, given that 55% of foreign buyers came from the traditional European markets: Italy, France, Portugal, the United Kingdom and Germany (which accounted for 36.84% of all foreign visitors), plus Russia, Algeria, Morocco, the United States, Belgium and Poland. 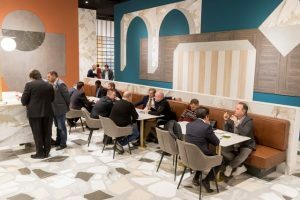 The profile of the visitors to Cevisama was primarily retailers, distributors, manufacturers, sales agents, buying groups and specifiers, especially architects and decorators. 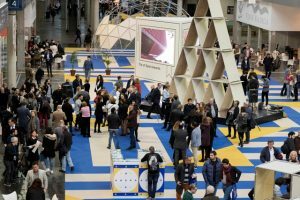 The latter group are becoming increasingly interested in Spanish manufacturers and Cevisama’s organisers are therefore focusing on growing attendance by these professionals even more. It should be remembered that several new initiatives were launched this year with precisely that aim in mind, including a hall dedicated exclusively to the Contract sector. The investment is beginning to pay off and, in fact, the organisers’ have calculated that architects and interior designers as a percentage of all visitors increased from 10.25% in 2018 to 13,67% in 2019. According to the final report on the fair, 73.6% of visitors were interested in ceramic tiles, 51.7% in bathroom furnishings, 38% in natural stone, 34% in roof tiles, bricks, glass bricks and display furniture and 26% in raw materials, frits, glazes and colours for ceramic tiles.